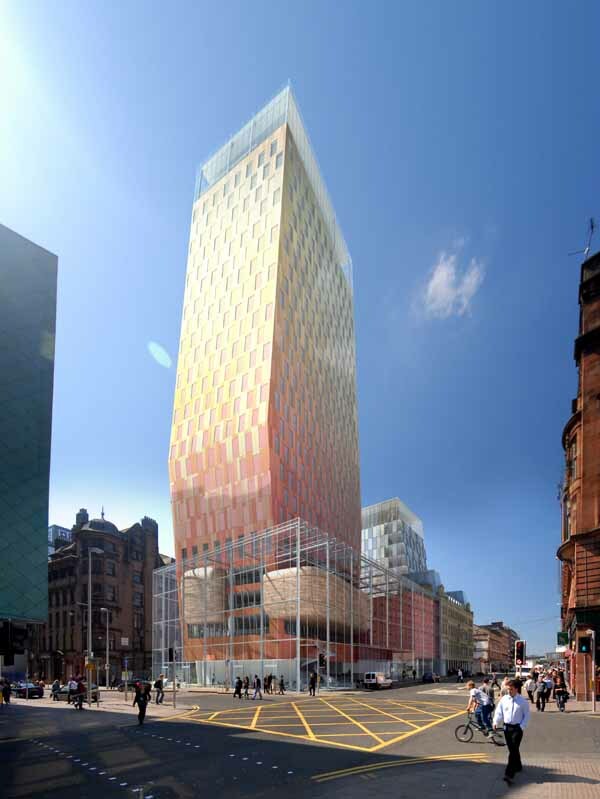 Glasgow City Council could use Compulsory Purchase Orders (CPOs) to remove existing owners standing in the way of the £125m 26-storey hotel & adj. 12-storey serviced apartment block by Ian Simpson Architects. Developer of the Argyle International Hotel, Charles Price, in the weekend’s Sunday Herald: “I asked architect Ian Simpson, at our first meeting with council officers, to design an iconic building rather than just another soulless skyscraper. A special building that gives a sense of identity, which could host leaders, even the President of the United States…One of the officers subsequently said I had kept my word.” However, there is one potential snag: Edward Fox, who owns Robert Biggar pawnbrokers at 311 Argyle Street, and who already moved when the adjacent Radisson Hotel was built, has said he will not sell his property to Price. Another Michael Forbes v Donald Trump situation? The decision was delayed for a week due to the number of applications submitted to the planning committee recently and within the context of a recent debate about Glasgow’s tall building policy. The council refused planning permission for a 20-storey hotel on the same site two weeks ago which was designed by Young and Gault. Progress Property Developments Limited today lodged its planning application for a new 158 bedrooms/suites 6 Star Deluxe International Hotel and an adjoining block of 68 serviced apartments. The 32,000 sq m scheme has been designed by Ian Simpson Architects, who are internationally renowned, and is located in the heart of Glasgow’s International Financial Services District (IFSD) within walking distance of Glasgow Central Station. All the Argyle Hotel bedrooms will have a minimum gross floor area of 37m2 and over a third of the accommodation comprises executive rooms/suites ranging from 38-70m2 and two presidential suites each of 80m2. The adjacent serviced apartments will be the first purpose-built serviced apartment block in Scotland to be directly linked to a luxury hotel. The owners/occupiers of the flats will have direct access to the hotel and all its services and be served by its own Concierge Reception/entrance. Progress Property Developments is a substantial privately owned property company specialising in major city-centre regeneration development projects throughout the UK. PPD’s CEO and owner is Glasgow born Charles Price and the company operates out of offices in Glasgow and London. “We have planned this energy-efficient development to compliment Glasgow’s aim to become a world-class city. To achieve this we have researched the hotel and serviced apartment market throughout Europe and the Middle East. Our aim is to produce a world-class facility to service the increasing number of business visitors to Glasgow”. “Hotel occupancy in Glasgow is currently running at its highest ever level, and there is an acknowledged shortage at the top end of the local market. The proposal to develop the 6 star Argyle International Hotel will allow the city to compete even more strongly to attract new conference and business tourism into the city.